Today's mail contained an envelope from Fords, NJ. Inside, a full-page hand-written letter from Sean over at Condition:Poor. He first thanked me for the cards he received in his "Last Great Giveaway" package, and then apologized for not being able to return to the favor en masse. I do appreciate the part reading, "I know the point of the giveaway was to get rid of cards..."* What he was able to include is one of the greatest custom cards I have received. It is a 2010 SlangKo Al Rosen Commemorative TTM Autographed card!! Holy FRIGGIN COW!! 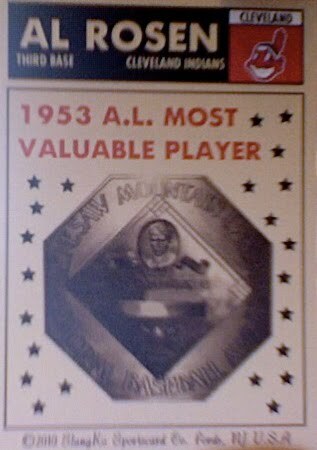 The card celebrates Rosen's 1953 MVP Award! My apologies for the poor picture quality, but the MacBook's built-in camera does not do 'macro' shots. Dang it. I may get a chance to rescan these at some point. THANK YOU, Sean!! This card is absolutely incredible! I cannot tell you how much I deeply appreciate such a unique collectible! *As always, I deeply appreciate any cards that are sent my way. There is never any required or expected return on the cards I send out. It's something I enjoy and love doing it as part of my love for the hobby and the hopes that it keeps our hobby alive. Matt F dropped an envelope in the mail to me not long ago. 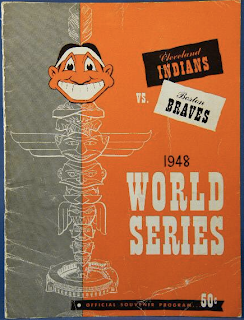 Inside the package were little blue notes attached to various stacks of Indians cards. 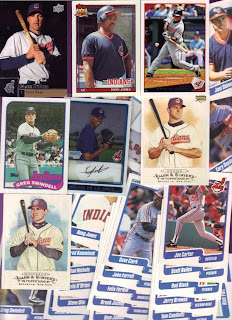 "I tried to send you only some older or oddball cards so they weren't all doubles for you. Enjoy!" 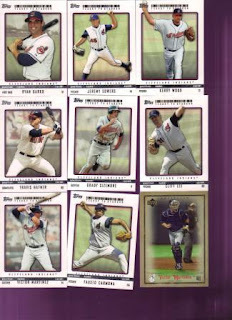 I don't believe I have seen the Pronk Elements opaque card before! And one Westbrook Bowman is thick, the other is 'normal.' 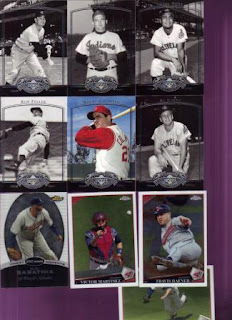 Again, I don't know the significance there, but I don't really care - they are GREAT cards! I love Conlon cards! It's great to be able to get cards of the folks that would have never had a card otherwise! 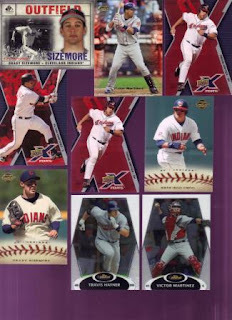 I don't think I've seen a card like the Sizemore Opening Day puzzle piece either. Fantastic! 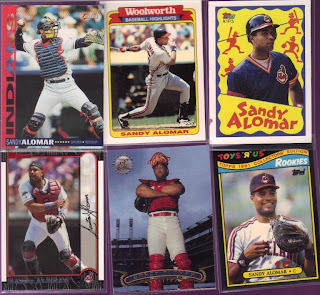 And what would a stack of Indians be without some Alomars thrown in for good measure!? 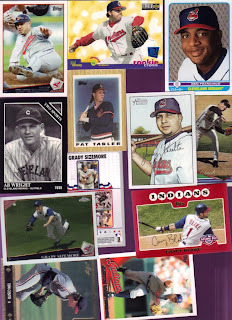 Another pile of cards read, "I don't think a person can have too many Allen & Ginter or Masterpieces cards." I agree wholeheartedly! 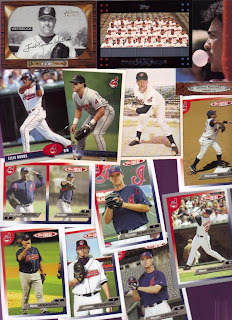 And the last note read, "Here are my 2010 Tribecards." These are AWESOME! THANK YOU, Matt F! These are great!! I have suddenly found myself way behind the trading curve! I am keeping tabs, folks! The posts appear in a three-way cross-posting between "A Pack A Day," "A Pack To Be Named Later," and "Things Done to Cards." Yeah, I'm Looney like that. The note inside read, "Hope you don't mind but I built a little pile of Indians..." Those were the words from none other than JackPlumstead in merry ol' England! Rest assured, I *never* mind!! 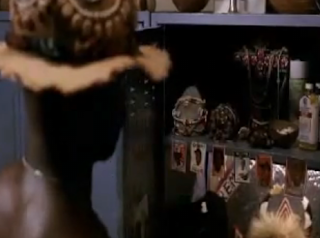 I also need to amass some Red Sox for you, pal! 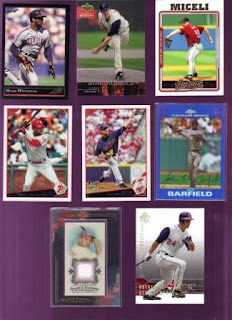 Inside the envelope was a very nice stack of cards indeed! Also included, a variety of makers, players and years! 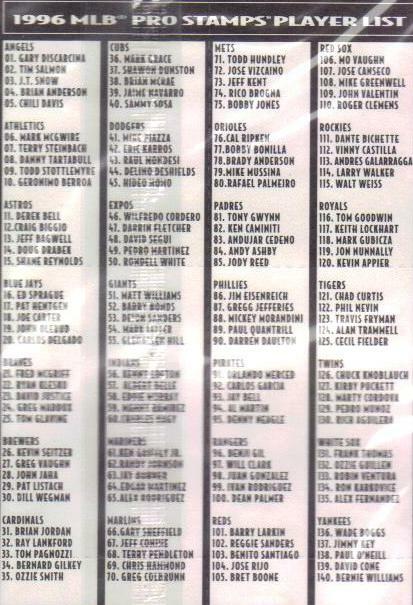 How can you argue with what is most likely a full team set of 1990 Fleer!? You can't. It is just awesomeness! THANK YOU, as always, John from across the Pond! If you haven't discovered the new card blog, "One More Pack," I recommend heading over and saying "HI" to Eli!! His first post-inaugural offering features an autographed card of Bucky Dent! Now, THAT is how to start a party! 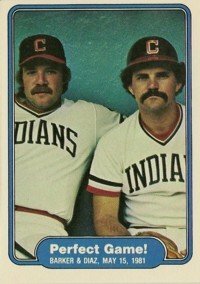 eTopps has released two Indians tribute cards. 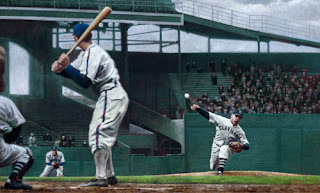 The latest is the Bob Feller you see above. 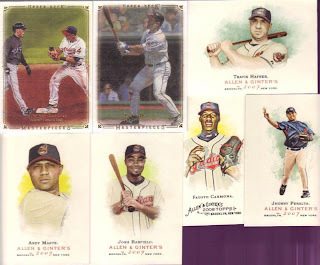 I enjoy the eTopps cards, and had been a VERY active member of the community for many years before selling off just about everything in my portfolios. 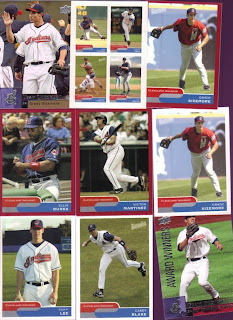 At one point, I has a complete set of the 2002 series, though given the pricing on that, it was not hard to do. What I finally did was get the cards in my portfolio sent to me, and then I dumped those into the giveaways I did recently. Share the love, ya know? Does anyone else collect eTopps? 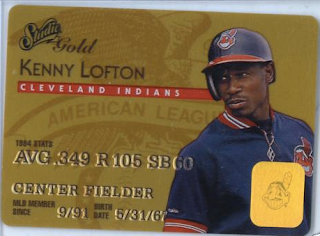 Nowadays, I like to wait until football season comes around and pick up the cards I want a whole lot cheaper than IPO or at higher pricing during the baseball season. The back of the card features the Cactus League logo, "RBI," the player's name and a tidbit of info about the player. There is a place for an autograph and then relevent copyright info (such as the publishing company). 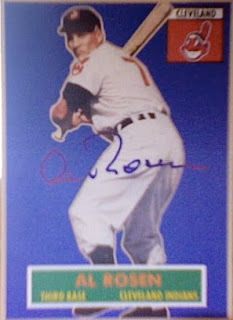 The front of the card (well, the photo portion) is top-notch for the time (I am assuming circa 1990). The back of the card, however, looks like a kid drew it. 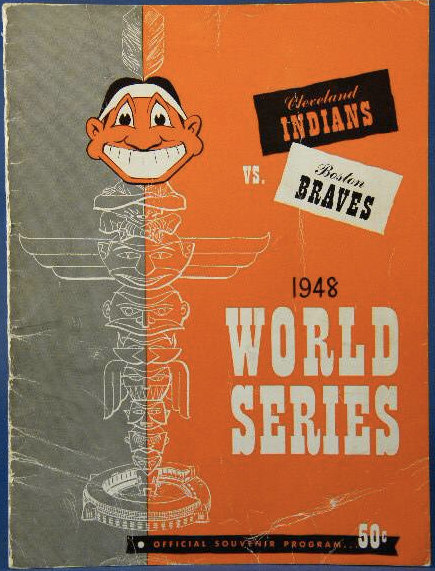 Well, actually, it looks like a colorized version of the little comics you see on the back of some Topps cards. I did manage to find references to the "R.B.I." but so far, nothing specific to this card set. 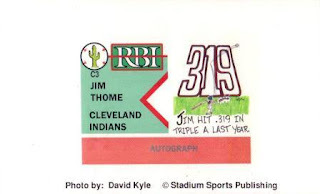 Though I have been tempted to cut the card down to the size of the Thome bordered section, I realized that doing so would mess up the back. Thus, I will find a pocket page to accomodate this very oddly proportioned card when it goes into my collection. Today, ex-Triber Brian Giles announced he was hanging up his cleats for good. 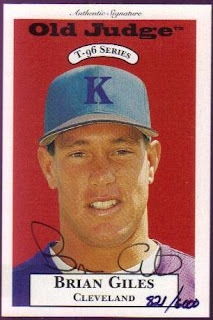 He's reached that "critical" age of 38 and had signed on with a minor league team in hopes of rejuvenating his career. Alas, injuries set him back and he has opted to say goodbye to the player-side of the ball field. Giles played with the Tribe from 1995 through 1998. He played in 299 games with 857 at-bats. He scored 150 runs on 243 hits, 48 doubles, and just 4 triples. 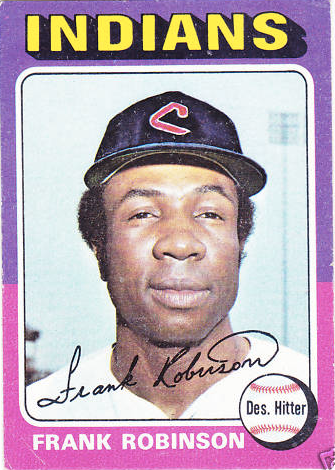 He knocked in 48 home runs bringing in 157 RBIs as an Indians player. Though he struck out 139 times, he was walked 155 times, walked intentionally 14 times and hit by pitches 4 times (3 of which came in 1998 - OUCH!). As a Triber, Giles garnered a .362 bating average and a slugging percentage of over .600! 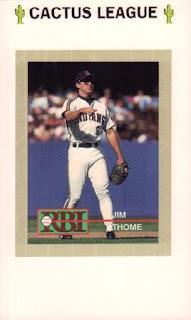 In the 1997 World Series, he batted .500, getting 2 hits, a double, scoring a run and getting 2 RBIs. I wish him all the best in the future!! 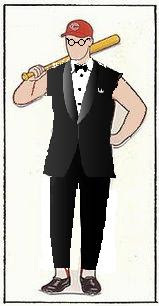 The ladies over at www.DingedCorners.com laid down the gauntlet, challenging other bloggers to find cards where something else is going on in the background. 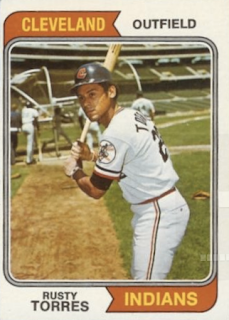 I chose this 1974 Topps Rusty Torres. Not only do we see a glove casually tossed aside on the right, but the card itself is actually dominated by the batting practice taking place behind poor Rusty. This picture would never happen in today's practice sessions due the Arkansas Traveler coach that was killed by a ball hit down the line, hitting him in the head. Before Christmas, JustinG wrote to me and asked if I would like some "gifts for Festivus." 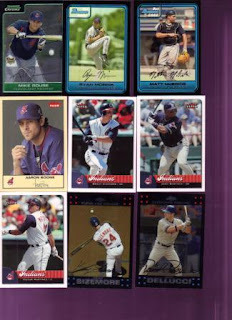 I am never one to turn down an offer of Indians cards, so I agreed whole-heartedly. And, I have to say, it was a Fesitvus to remember! There is a lot of gold and silver (er, that should be "Silver and Gold... Silver and gold...") in them thar cards! Not only that, but a freakin Grady Sizemore game-worn jersey card! Holy Festivus, Batman! SWEET! THANK YOU very much, Justin, for your generosity and for spreading some holiday cheer! If you got some cards from me and you've posted about them, please let me know! I love reading what you have to say (good, bad or ugly) about the cards I send out!! 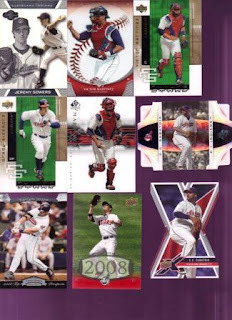 Now, *THIS* is the set of cards everyone should be talking about in 2010! These came from a pack of Phungo's latest release. I received a refractor Belliard from Topps, but the next card is way cool! 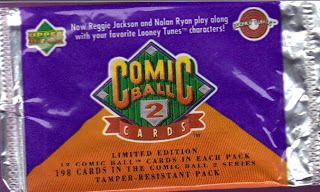 It is a limited edition black-bordered insert! 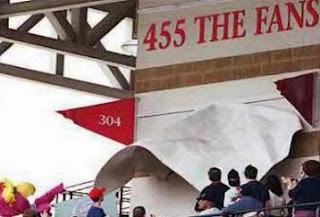 And, it is the Retired Number from the Indians!! WAHOO!! I also got a Dickie Noles giving a thumbs up to Phungo! Check out the other cards (and comments), too! Oh, yeah! We've got CC and Lincecum in here, along with big (and I do mean BIG) Thomas Jefferson! Rounding out the pack, we've got Arkansas' own Cliff Lee in a Phungo Phillies uni, plus two vintage Tribers: Jim Piersall and Ray Narleski!! Dude, YOU ROCK!! Thank you so much, Phungo, for another great pack of cards! I found it funny that on the day the USPS was asking Congress to cut back on their working days, I managed to mail off enough packages (many of which went Priority since I had gobs of those little boxes) to cover the daily pay of at least one postal worker and part of another's. The trip required me to visit my vehicle twice. Rather than unload everything at once, I opted to break the mailout into two purchases. This helped get folks that had very little USPS business at hand to conduct their transactions between my trips. I saw no reason to tie up the line for 30 minutes all by myself in one fell swoop. Many patrons were appreciative of my arrangement. As it turns out, Phoebe (my boss) happened in during my second load of packages. To say the sheer number of items I was sending out overwhelmed her would be something of an understatement! And while that was not anywhere on my radar when I came up with the idea of the "Great Giveaway," I have to admit that watching people's faces (especially that of the clerk behing the desk processing each of these packages) really brightened my day. I've said all of that to say this: Everyone's packages have been mailed! Except for the APO and my friends in Canada, everyone should get theirs by the end of the week, I would think. Thanks to everyone who helped me get all those cards out of the house! Now, I just need to clean up the aftermath of sorting, packaging, etc, and my better half will be a much happier camper. I will say, she has taken all of this in stride. After all, my card habit is on par with her shoe habit... Well, not in number, of course, but in the amount of space they take up. Okay, maybe her shoes dont' take up QUITE as much space. Happy collecting, everyone! 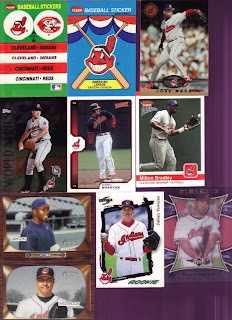 Tribecards is officially "back on the air!"